39 new Khitan building pieces. A full set of building pieces with the same stats as existing tier three. 15 new armor pieces in three sets, such as the Khitan Officer Armor. Light, medium and heavy sets with an epic end-game version of each. 9 new weapons in one Khitan weapon set. Same power as iron weapons with an epic end-game version of each weapon. 5 new warpaints in Khitan style. Decorative warpaints in jade, black, white and red. 25 new placeables, such as a dragon idol and hanging lamps. Can be created at an all new Khitan Artisan station. 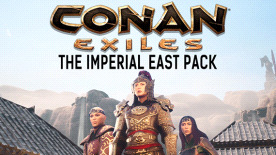 Please note: This content requires the base game Conan Exiles in order to play.